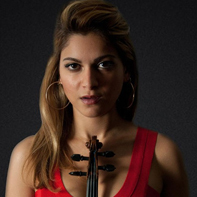 Yasmine Azaiez started to play the violin when she was 4 years old in Great Britain, and when she was 8, she won a place at the prestigious Yehudi Menuhin School. At the age of 17, she came second in the annual “Young Musician of the Year Competition” in Sevenoaks, Great Britain, with a panel of judges made up of eminent teachers from the Royal College of Music in London. The judges said of her: “Immense talent, with an excellent and exciting professional approach and a unique, unbelievably charming stage presence”. She continued to study at the Yehudi Menuhin School until 2008, and played in many concerts put on by the school. When she was 18, Yasmine won a place at the New England Conservatory in Boston, USA. In 2010 the Dean of the Conservatory named her as Honor Student. In June 2010, she was chosen as one of nine finalists in the Global Youth Violin Competition in Sydney, Australia. Yasmine is currently performing as a soloist. Her musical style is a multicultural mix of jazz, classical and oriental music.